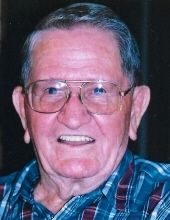 Mr. Leon McCutchen, long time resident of Hereford, passed away on Wednesday, September 19th at the age of 95. Mr. McCutchen was born August 18, 1923 to John Phillip and MeLetie (Allred) McCutchen in Gould, Oklahoma. The family came to Hereford in 1934. He served his country during World War II, enlisting in the Marine Corps in Amarillo, Texas in 1942 and was honorably discharged as a Corporal in San Diego, California in 1946. He met Mary Mae Lucas and the two were married in Portales, New Mexico on January 28th, 1950. Leon worked as a letter carrier for the US Postal Service for nearly 39 years until retirement. He also served as a deacon at the First Assembly of God church for nearly 30 years and was a little league coach in the 1960’s as well as serving as a volunteer for the Hereford Senior Citizen’s Center for 20 plus years immediately following his retirement. He married Ada Smith on September 26, 2000 in Hereford, Texas. Mr. McCutchen is preceded in death by his parents, and by his wife Mary Mae. Those left to cherish his memory are his wife of 18 years Ada McCutchen, his daughters Patricia Eschenberg of Rochester, Washington, Gayle McCutchen of Angel Fire, New Mexico, Pamela Hasford of Angel Fire, New Mexico, his son Michael McCutchen of Lawrenceville, Georgia, his step-daughters Diane Cathey of Amarillo, Texas, Gaylene Thompson of Coleman, Texas, LeAnne Bolen of Ballinger, Texas, and his step son Kenneth Little of Abernathy, Texas. He also leaves behind his grandsons Scott Eschenberg of Corpus Christi, Texas, Rusty Eschenberg of Rochester, Washington, Brian McCutchen of Philadelphia, Pennsylvania and granddaughters Erin Spencer of Angel Fire, New Mexico, and Charlotte McCutchen of Estes Park, Colorado. In addition, his niece Deborah and husband Bill Brantley of Canyon, Texas, many great-grandchildren, nieces, nephews, and friends remain to cherish his memory. The family requests that, in lieu of flowers, donations be made to the King’s Manor Retirement Center. "Email Address" would like to share the life celebration of Leon McCutchen. Click on the "link" to go to share a favorite memory or leave a condolence message for the family.